According to the US Department of Labor’s Occupational Safety and Health Administration, scaffolding, ladder, and other fall protection safety regulations are amongst the most commonly violated. In addition, falls are the number one cause of construction site injuries and wrongful death in the US. If you or a loved one has been injured in an accident involving a ladder or scaffolding based on the negligence of an employer or other party, you may have a strong personal injury claim. The personal injury lawyers of Kamensky, Cohen & Riechelson have been assisting clients with recovering full and fair compensation for their ladder and scaffolding accident injuries since 1972. We serve local Pennsylvania clients from towns like Northeast Philadelphia, Levittown, Bensalem, Millbrook, Penndel, Feasterville, and the greater Bucks County area. Lean on our extensive experience to seek a successful verdict or settlement in your ladder or scaffolding accident personal injury claim to help ensure your family’s financial future. Call our office today to speak with a member of our experienced legal team in a free and confidential consultation regarding your personal needs and concerns surrounding your ladder or scaffolding accident. The Occupational Safety and Health Administration has strict regulations governing proper use of both ladders and scaffolding for men and women on the job. If our Northeast Philadelphia attorneys are able to show that your injurious accident was caused by a violation of one of these regulations, that is a valid basis for a personal injury claim. However, that is not the only recourse available to our clients. The negligent or reckless actions of a foreman, coworker, or other individual may be grounds for a personal injury claim as well. For example, if a foreman asks his or her employees to work unreasonable hours, leading to worker fatigue, which indirectly leads to a ladder or scaffolding accident, the foreman may be found at fault for endangering the workers. 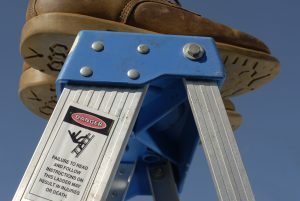 You may also have a product liability claim if the ladder, scaffolding, or the associated components were defective or malfunctioning. In this case we may be able to find the manufacturer, assembler, wholesaler, or retailer of your equipment to be liable for your injuries. At The Law Office of Kamensky, Cohen, & Riechelson, our experienced personal injury attorneys strive to recover compensation which our clients need to move on with their lives in the aftermath of a ladder or scaffolding injury. Allow us to fight on your behalf as we have been doing for over four decades in local Pennsylvania towns like Northeast Philadelphia, Bensalem, Levittown, Penndel, Millbrook, Feasterville, and all of Bucks County. Contact us online or through our Bensalem offices by calling (215) 337-4915 today to speak with a member of our legal team in a free and confidential consultation regarding your ladder or scaffolding personal injury claim.